Hera at the end of a good day of upland hunting. This entry was posted in Brittany (dog), Dog training, Gun dogs, Guns, Hera, Hunter safety, Hunting dogs, Pointing dogs, Ruffed grouse hunting, Shotguns, Small game hunting, Upland bird hunting, White-tailed deer hunting, Wildlife habitat, Woodcock hunting and tagged Brittany, Brittany (dog), Brittany Hera, cover, Cowan's Corner, deer hunting, deer stand, Franchi Instinct SL, grouse, Jason Quinn, Marlborough Forest, non-hunters, pointer, Ruffed grouse, white-tailed deer, white-tailed deer season, Woodcock, woodcock hunting on October 30, 2016 by geoffreyandmika. Hera chewing on a bone she found at Schäfer’s Wood. It is the end of October and the 2016 woodcock season is winding down. The forecast was for light rain, but virtually no wind this morning when I set out with Hera for the Marlborough Forest. We got away a little later than usual as I slept in a bit. We arrived at Cowan’s Corner close to 9:00 am. I hoped there might still be a few birds in the cover, left over from the great shoot we had the previous Monday afternoon. It snowed on Thursday and there were remnants of this on the ground as we approached the forest. It was overcast, but not raining when I set out with Hera at Cowan’s Corner for what turned out not her best day in the field. She locked up on point very quickly only to jump the gun and bump the bird before I could walk up her point. I bumped a second bird in short order, it flushed unseen. Hera was back in form when she pointed the third bird we found at Cowan’s Corner. It was in thick cover so I was well pleased when I flushed it over her point and got it with my second barrel. Hera made a good retrieve and we moved on. 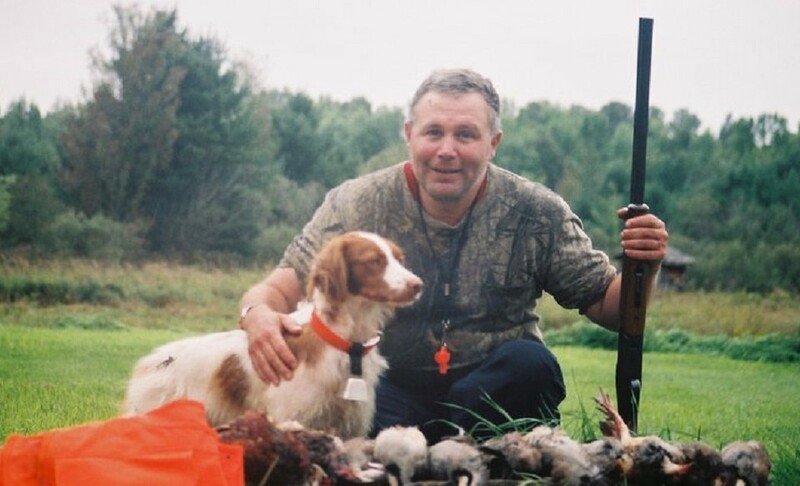 This entry was posted in Gun dogs, Hera, Pointing dogs, Ruffed grouse hunting, Small game hunting, Upland bird hunting, Wildlife habitat, Woodcock hunting and tagged Brittany, Brittany (dog), Brittany Hera, Cowan's Corner, Gun dog, gun dog training, Hera, Lester's Square, pointing dog, Schäfer's Wood, Woodcock, woodcock hunting on October 29, 2016 by geoffreyandmika. Mike and I on our first hunt together. This entry was posted in Dog training, Firearms, Gun dogs, Hera, Hunting dogs, Pointing dogs, Ruffed grouse hunting, Shotguns, Upland bird hunting, Woodcock hunting and tagged Brittany (dog), Brittany Hera, cover, covert, coverts, Cowan's Corner, German Shorthaired Pointer, hunters, hunting buddies, hunting season, Lester's Square, Marlborough Forest, migration, photography, Ruffed grouse, Schäfer's Wood, video, Woodcock, woodcock hunting on October 24, 2016 by geoffreyandmika.